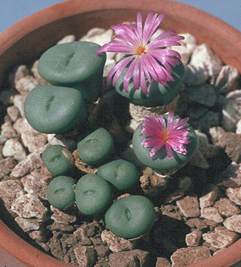 Lithops are very simple plants. All you get are two leaves, each mostly filled with water holding cells. 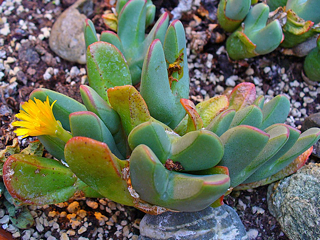 They are dormant when the weather is too hot or too cold, and grow most in the spring. 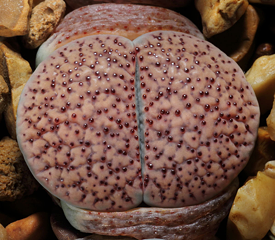 On a fine level, no other genus has such a wealth of variation in color, shape, texture and pattern. 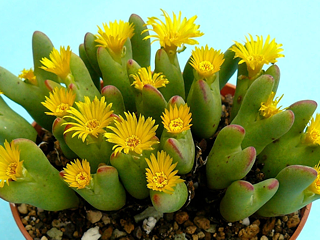 (except maybe Conophytum). 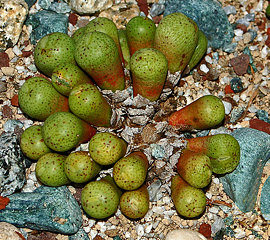 There a little less than 60 species, about 800 or so known local variations of the species, and a few hundred named and unnamed cultivars. 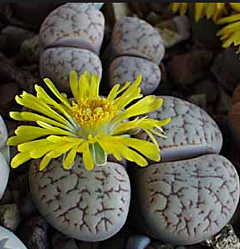 No two Lithops plants look the same, yet a knowledgeable grower can identify most species. 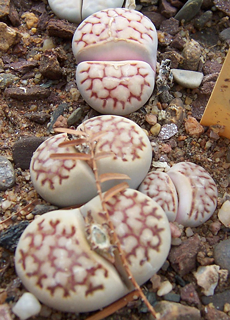 There are as many successful ways of growing Lithops as there are growers, and the cultivation practices are modified to fit individual habits, and local microclimates. The basic cultivation routine is: Stop watering after flowering, or at the end of November, except for L. optica which needs water until the end of December. Start watering after the old leaves completely dry. (Usually late March or Early April) Water freely during the summer. Grow them in an open, fast draining mix. Most growers use at least 50% pumice, some sand, and little organic material. Keep peat out of the mix. Some good growers fertilize frequently, some hardly ever. Keep them dry during the winter. 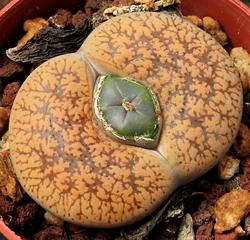 Lithops are small, they don’t take up much room. They are easy to grow from seed, with seed planting best in either October or April. There are good growers who do it both ways, and some who do it both times. 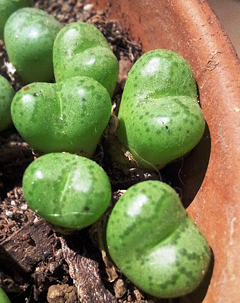 Because they are small and inexpensive, its best to grow them in quantity. 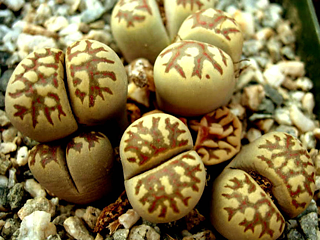 Most of the people who can’t grow Lithops, have killed a few one by one. They are best grown by the dozen. 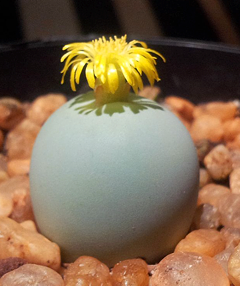 Even the best growers have plants that mysteriously dry up, or leave during the night. 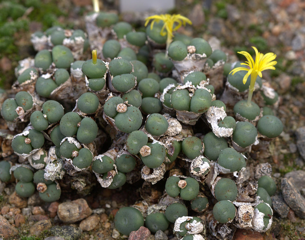 Conophytum is a large genus of small plants. They are winter growing. They generally, but not always clump. 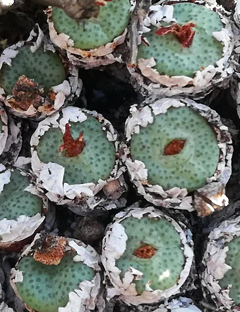 They are relatively easy to grow, as long as they are allowed to be dry when dormant, and then protected from overheating and desiccation. An eastern exposure is often recommended. 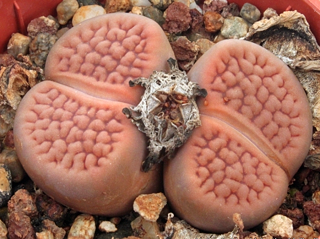 They are readily available as plants and seeds. 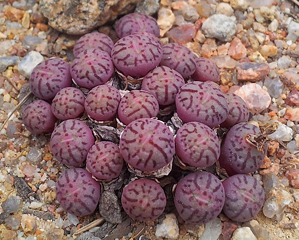 Once the knack is acquired, most Conophytum are easy to grow. 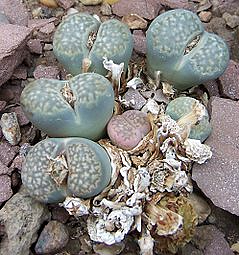 In late July, Conophytum are generally dormant, and are covered by the paper thin leaves from last year’s growth. 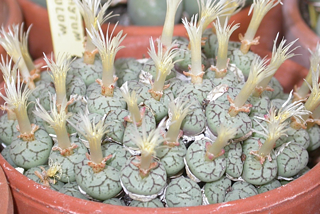 The bilobum types tend to be easier (more forgiving of watering errors) for beginners. These have two definite leaves, with a deep notch between them. 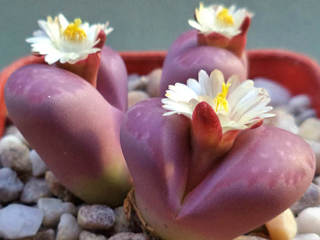 The more difficult small round leafed forms provide an additional challenge, and additional rewards with spectacular colors, patterns and shapes. A large collection can be maintained in a very small area. From the Latin, meaning pebble or stone. Named for Dr. Dorothea Christina van Huyssteen. Of or from the Karas Mountains, Namibia (South Africa). 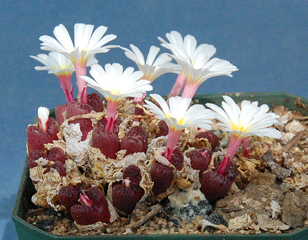 Named for Carl Anton Meyer or Ernst Heinrich Friedrich Meyer, both were 19th century German botanists. From the Greek optikos (vision, eyes); for the eye-like appearance of the top of the leaf pairs in the Lilthops species.